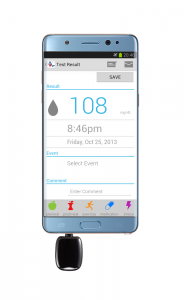 Philosys have successfully upgraded the blood glucose managing application for Gmate Smart in Samsung Galaxy Note 7. Philosys have continually upgraded its application up to date when a new android phone was introduced to the market (Galaxy S7, Galaxy S7 Edge, LG G5 etc). This agile response to changes has allowed Philosys to become a leader in Smartphone glucose applications. Superiority of technical expertise and quality control has allowed Philosys to make a contract with KDL (Shanghai Kindly Enterprise Development Group) for 62.4 million dollars. Philosys is also on the verge of making contract with a Mexican medical device company called DentiLab on September. Gmate can be connected to the Smartphone for application, which allows vocal support and immediate sharing of blood glucose results to doctors. Moreover, it has the advantage of continuous management of blood glucose and elevated usability function. These convenient functions have created major popularity in foreign countries and due to this very nature; there are more overseas inquiries than those of domestic inquiries. Philosys is planning to build a 3rd production facility due to multiple foreign contracts and domestic product launch in October.